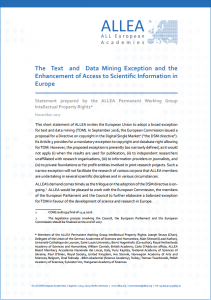 ALLEA calls, in a statement published on 15 November 2017, for a broader exception for Text and Data Mining (TDM) in the proposed Directive on copyright in the Digital Single Market. The position, prepared by the ALLEA Permanent Working Group Intellectual Property Rights, responds to a European Commission Directive on copyright in the Digital Single Market, currently under trilogue discussion between the European Council, the European Parliament and the European Commission and which will be voted on by the European Parliament at the end of November. The paper, titled “The Text and Data Mining Exception and the Enhancement of Access to Scientific Information in Europe”, states that while Article 3 of the Directive provides a mandatory exception to copyright and database right allowing for TDM, the proposed exception is still “too narrowly defined”, according to the expert group. The current proposed legislation would not apply (i) when the results are used for publication, (ii) to independent researchers unaffiliated with research organisations, (iii) to information providers or journalists, and (iv) to private foundations or for-profit entities involved in joint research projects. “Such a narrow exception will not facilitate the research of various corpora that ALLEA members are undertaking in several scientific disciplines and in various circumstances,” the authors state. ALLEA, representing 59 academies from more than 40 countries from the Council of Europe region, urges the European Institutions to elaborate a more balanced exception for TDM taking the needs of science and research in Europe better into account. ALLEA is prepared to engage with the European Commission, the members of the European Parliament and the Council to to further elaborate a balanced Directive. The ALLEA Permanent Working Group Intellectual Property Rights combines decades of highly specialised expertise in the European legal framework for patents or copyrights. Previous ALLEA publications on the topic of open access in Europe include: “Open Science for the 21st century” (2012), “The Enhancement of Open Access to Scientific Publications in Europe” (2013), Supplementary Statement on the Enhancement of Open Access to Scientific Publications in Europe (2015) and Follow-up Statement on Open Access (2015).